Palm Breezes is back, fully restored after the hurricanes and better than ever! Wonderful for an affordable family vacation or romantic getaway, Palm Breezes is a penthouse condo in the intimate Battery Hill complex. We are close to the best beaches, and a short walk to the charming town of Cruz Bay with its busy harbor, exceptional restaurants and unique shops. The complex has a sparkling pool with surrounding deck that offers splendid views of the Caribbean and has a gas grill and deck furniture for your use. We enjoy almost constant ocean breezes and sea views in three directions. We provide on-island management service at no additional cost. The covered balcony is furnished for outdoor dining. It is perfect for sipping morning coffee and provides a beautiful view of the harbor, the town and open ocean. At night, it is a romantic spot for sharing evening cocktails and the twinkling lights of St. Thomas. You will appreciate our new granite kitchen, beach rock shower and new tile floor. The soaring two story beamed wooden ceilings are gleaming white and provide a wide open feel. As we are close to everything, a rental car is nice, but not necessary. Comfort and Convenience: This condominium is brightly furnished in tropical décor, designed to put you in 'Island Mode'. You will enjoy the fully equipped kitchen, dining area, and a comfortable living room stocked with cable TV, VCR/DVD, stereo and a selection of books and games. The second bedroom is a large loft, and provides plenty of room for everyone to spread out and relax. The MBR has a queen size bed, the upstairs loft is furnished with one queen and two single beds. Nearby Beaches, Snorkeling, Hiking: The island of St. John is hilly and scenic, and boasts some of the best beaches anywhere. You can walk to Frank, Soloman and Honeymoon beaches. Trunk Bay, the most photographed beach in the world, is about ten minutes away, and offers a popular underwater snorkeling trail. Salt Pond beach is another sure fire snorkeling opportunity--we rarely leave without seeing amazing sea turtles. As over two thirds of the island is a national park, St. John provides many hiking opportunities, ranging from the easy to the challenging. Some wind past ruins of sugar mills; another takes you to an ancient pool and petroglyphs. Palm Breezes is the perfect spot to anchor your perfect vacation. We are now empty nesters, a lawyer and a law professor, who very much enjoy get togethers with family and friends 'on island'. Our first trip to St. John was in 2002, we came back a year later with our two then teenage children, then purchased our property in 2004. We fell in love with the peace and beauty of St. John and knew we would always want to return. We wanted to be somewhere we would not be tied to a car--we do like to walk and from Palm Breezes it is an easy walk into town for dinner or just drinks at the Beach Bar. We also are mesmerized by the beautiful views, they melt away the stress of our NJ existence! Being able to walk into town is a real plus. Also, if we decide to drive to a North Shore beach, and some want to head back earlier than others, the sun worshippers can stay as long as they like, as it is easy to catch a cab back into town and then walk home. We also love the beautiful pool and pool deck--the perfect place for an umbrella drink after returning home from the beach or to grill on a 'cook in' night. Tile bath with glass block shower with beach rock shower floor. Two windows and linen closet. Palm Breezes is fully air conditioned. All linens, including beach towels, are provided. Full kitchen, recently remodeled with granite counters and stainless steel appliances. This was our 4th stay at Palm Breezes. The condo and island are as lovely as always. Both have recovered nicely. And we will be back again! We thoroughly enjoyed our return stay at Palm Breezes in Cruz Bay! It is an awesome place with a great location and beautiful view of Cruz Bay, St. John, St. Thomas and other islands. Sunsets are spectacular! It is just a short walk away from the shops in downtown Cruz Bay and the ferry dock. Pat, the owner, and her concierge group were so helpful to us in assisting with arrangements, provisioning, and booking our boat ride to Joost van Dyke. We had a great time snorkeling off the boat and going to Foxy's and Soggy Dollar Bar! Palm Breezes has a very clean pool that we enjoyed on several days. Also, laundry facilities are available onsite and free, so that was quite helpful as well. We made use of the kitchen many times whenever we weren't dining at Banana Deck, Cruz Bay Landing, Skinny Legs, or other great restaurants on St John. We highly recommend staying at Palm Breezes in Cruz Bay on St John! We had a wonderful time and look forward to returning again in the future. Cannot say enough good things about our stay on our favorite island. Arrived with my wife and adult son just after Thanksgiving and stayed for nine nights. Palm Breezes was very comfortable and spacious. Fantastic views from all the rooms and especially the enclosed balcony. Spent many mornings and nights on the balcony just enjoying the sights and sounds of Cruz Bay and the surrounding Islands. My wife brought some work with her and declared the Wi-FI to be great. Pat, the owner and Sherrolyn, the property manager were very responsive to any questions I had. Kitchen was well stocked with everything we needed. Free use of the guest washer/dryer was welcomed . Excellent air conditioning when we needed to use it. Used the common pool every night after a day of hitting the beaches. Often was the only one there. Love the location on Battery Hill. Easy walk to town if you can handle one steep hill. Met several of the owners who were in residence while we were there and they were very gracious and went out of their way to welcome us. Would not hesitate to stay at Palm Breezes again. Another perfect St. John visit! Thanks for your great review! I am so glad that Palm Breezes worked so well for your family! Great Stay - Second Time! This was my second stay at Palm Breezes. First time with my sister, niece and nephew in Feb 2016 - this time with my husband and two teenage boys. The unit is exactly as described - fully and thoughtfully furnished - within walking distance of all the action (lsland style - laid back) that Cruz Bay has to offer. A few things that were different in July vs February. More mosquitoes - not enough to put me off, but I noticed them. Just bring or buy repellent, especially for early morning coffee or early evening cocktails on the patio. More bait pods encountered while snorkeling - huge 10s of thousands of silver bait fish at Trunk Bay!! We then swam right into huge tarpon feeding on them! And less...visitors, so shorter / no waits for dining. The kitchen is so well stocked that I really suggest eating in dinner a few nights to save $$ - we bought rib eye steaks at Starfish Market and they were very reasonable. The grill and my husband did a great job with them. The construction that began next door in Jan/Feb 2016 continues - we did not notice any noise, but the workers do park along the street making it essentially one lane. Just take your time and be prepared to pull over..or walk. Wonderful stay again, I am already trying to figure out to get back soon. St. John is the smallest, friendliest and least developed of the Virgin Islands. 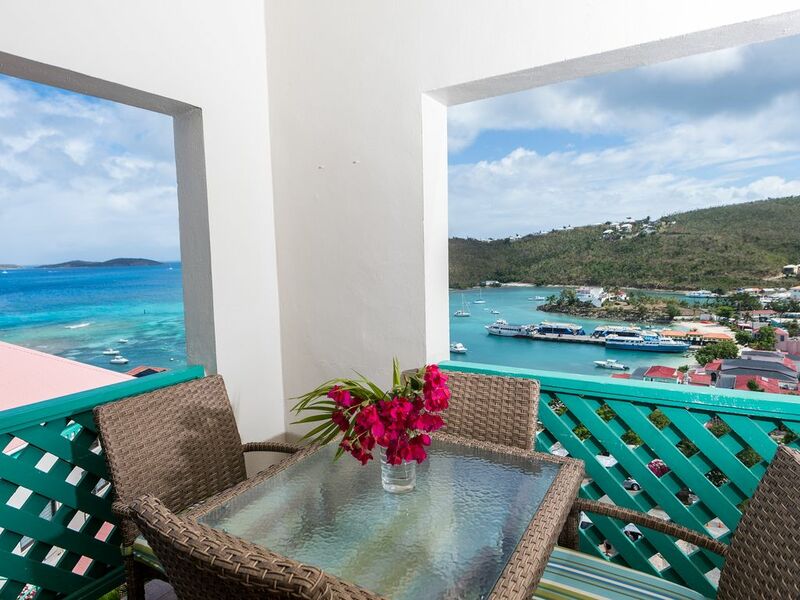 From this condominium you are perfectly located to enjoy St. John's peaceful and beautiful views, its pristine beaches, warm fish filled waters and romantic outdoor dining restaurants. Monthly rentals are sometimes available. Please call Pat Smith to inquire. 856-873-5521. Due to spiral staircase, children must be 6 and over.